I often wonder whether I am doing the right thing by pursuing this sabbatical. Is it really the best thing for my wife and I? Will this really benefit my kids? Can we really make this whole thing happen? I believe we can and I believe this to be the right thing but I’m also susceptible to doubt that tends to sneak in like a cold wind and chill me to the bone with negative thoughts. It’s now 2011 and we are only 6 months away from our planned departure date. It’s suddenly become so much more real. In many respects we are way behind the ball on our planning and financing. I’ve been incredibly overwhelmed with running two blogs, planning a sabbatical, trying to get my photography business into gear, working through a Project 365 and being there for my family. I’ve also been dealing with a back injury that has left me unable to sit for long periods of time in front of the computer further limiting my ability to do many of the things I need to do. 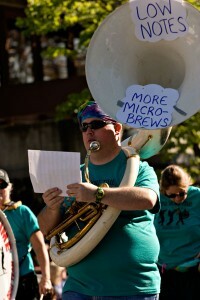 I need low notes and more microbrews. So with that in mind I’ve decided to reduce my posting schedule to once a week. New posts will now be published on Wednesdays. I hope this doesn’t disappoint the 5 of you who follow this blog but I really feel this is necessary in order to put more time toward my first priority which is spending quality time with my family and secondly planning and implementing this sabbatical. I need low notes and more microbrews. Of course I reserve the right to post whenever I want so don’t be surprised if I get inspired on a subject and just have to tell you about it. I pride myself on creating quality and whenever I feel like I don’t have the time to do that then I know some changes need to be made. Feeling overwhelmed and like things are spiraling out of your control are not good feelings to have so I really feel like this is going to be a good thing not only for me but for you the reader as well. For one, the quality of posts will improve. I’m not saying that what I’ve been putting out has been crap but I would love to spend more time to really get my thoughts and feelings out in a coherent way. I have several posts in the works that I hope will challenge the notion that you can’t travel once you have kids, or that taking a sabbatical is impossible for most people especially those supporting families. I’m also open to guest posts so if you have an idea on what you think is the perfect post that reaches out to someone who may be thinking about traveling or taking a sabbatical feel free to submit your ideas. Starting in February I will be launching an email series on planning and financing a sabbatical. This will go out on a weekly basis to everyone who is subscribed to the mailing list so if this sounds like something you would be interested in make sure you get signed up today so you don’t miss out. Once a week you will receive an email discussing subjects like why you would want to take a sabbatical, where to go on your sabbatical and options to pay for it all. It’s going to be a fun weekly series that will kick off sometime in February. I’ll provide more details in a couple of weeks. I’m also working on writing a couple of e-books that I hope to publish this year. The first book is a photographic journey of my first adventure to Indonesia. The second is a compilation of all 365 images from my Project 365 which is slated to end late February. I’m really excited about both these projects and look forward to publishing them. It’s ironic that the week that I start to feel like I need to take more time for myself and offline activities, Joel Runyon of Blog of Impossible Things puts together an awesome post on “Doing More Online by Doing More Offline“. Sometimes it’s good to just unplug. Sometimes you need to unplug. So there you have it! If you are new here and we haven’t connected yet I’d love to hear from you. Drop me a line and I promise to get in touch with you. I noticed that people thought I posted frequently because for eight weeks or so I had new posts three times a week but I’m a big believer in quality and lately I haven’t had as much to say so it’s now two times a week. Don’t worry people will read no matter how frequent or what day you post. Also on the change anxiety. I felt the same way when I was leaving my job for a year. I wondered if it would really be the best for my career. That doubt washed away as soon as I entered airport security. Thanks Ayngelina! I’ve always struggled with anxiety and doubt but I usually push through it and end up realizing that all that agonizing was for nothing. This is definitely one of the biggest life changes we have made (short of getting married) and I know that down the road it’s going to be all for the best. “The 5 of you who follow this blog . . .”? Funny guy! Matt . . . I hate hearing that you’re feeling overwhelmed, but I am glad that you’re going to take some time to make sure to take care of yourself first. We’ll all be here, eager to read when you do post. And know that you should touch base anytime if there’s anything I can possibly do to help you out. Lookin’ forward to those eBooks! Hey Mark! I appreciate your support and friendship. It was great to talk on the phone the other night with you and I look forward to meeting up again really soon. Oooh, sounds like cool projects are on the works. What is this project 365? I’m sorry to hear about your back 🙁 My wrists have been bothering me too (too much computering), and I have to force myself to be away from computer every so often. But like you said, it’s nice to be unplugged every now and then. Good luck with your projects! Hi Jill! Project 365 is taking a photo every day for an entire year. I started it back in February and am nearing completion. At the end I will put together an ebook that will be a compilation of all the images from the entire year. You can check them out now either on my photography blog (Matt Koenig Photography) or on my Flickr site. Hope your wrists start feeling better. I have to step away from the computer every 10 minutes to keep my back from seizing up. It definitely feels good at times to completely unplug. I agree with Ayngelina…we’ll read whenever you post so don’t worry. You’re right to step back and focus your energies where it will be most worth it. But DO keep moving forward! Remember, it’s not supposed to be easy…if it was, then everyone would be doing it. You won’t regret it. Cheers! Hi Gillian! We definitely will keep moving forward. This is a big dream for us and we have vowed to not let it stay a dream but to make it our reality. I need to get my back healthy in time for #WDS. You’re always better off writing better posts less frequently. If I don’t have any thing of value to say then I just don’t post any thing. Not great for consistency but much better for quality. Hey Nick! You’ve been pumping out some steller content and I really like your new site. We should Skype it up again soon. Thanks Matt, lets do it next week. Sounds great Nick! Let me know when. And putting the most into getting everything planned and done with your family is the most important. One thing I realized as I left is that it was really wise to do step-wise preparations. Like 6 months ago I moved into a smaller apartment, and in the process got rid of a lot of stuff. That really cut down on the time I would have spent in preparations just before the trip if I had departed from my larger apartment. And similar with clothes, storage, and everything else. Hey Ryan! You have not been the only person that had questioned me recently about how I manage to do everything that I was doing. The truth is I was hanging by a thread. Something had to give so I prioritized things. Family always wins out over anything. Having made the decision to cut back a bit I actually feel energized and more focused. I like your suggestion for step-wise preparations. I’ve definitely been in situations where last minute preparations made for a very stressful time. Hope things are going well in Columbia! When I was getting the blog together and simultaneously working on my 365Days project, I was about to go insane. More power to you in keeping up! Hi Erica! Project 365 is definitely a challenge. I started out strong and then fell flat creativity-wise and now can’t wait until it’s over. Only a few weeks left! It will be an accomplishment that I will be quite proud of. I enjoyed your Project 365 stream. Great work! Thanks! Just make sure you finish it! I’ve seen too many people fall flat a few weeks before. I am glad to hear that you know what you need to take care of yourself and your family. Your honesty and openness in identifying your challenges and finding solutions to decrease stress is absolutely inspiring. Thanks Judy! Sometimes the hardest part is convincing yourself that you need to step back and make a few changes for your own health and sanity. Of course it is the right thing to do! Never doubt it. If you didn’t take this sabbatical, you would regret it the rest of your life. I know we would! Thanks for the confidence boost Jason! I know I would regret it if I don’t move forward with it. I’m actually looking forward to stepping outside my fear cage. How are things with you? Things are good with us. With leaving on our RTW trip next year, we are really starting to move on our to do list. So much to do, so little time. And so much stuff to get rid of! Hey Jason! I know what you mean. We are often overwhelmed with the things we still need to do that at times we just freeze. Not good because our intended departure date is quickly approaching.